Goose eggs are big. Really big. They are much bigger than chicken eggs—about three times the size—but there's more to goose eggs than just their magnitude. Goose eggs are delicious and can be cooked in the same ways as hen eggs. When fried or poached create a pretty dramatic effect on the plate. They are quite a delicacy, which means they do come with a higher price tag. Just as goose meat is more flavorful than chicken meat, goose eggs have more taste than chicken eggs. They are richer, fattier, heavier, and more deeply colored. They just taste eggier. One reason for this is that geese are almost exclusively raised on pasture. They hunt and peck for much of their food, which results in a rich and varied diet that then causes deeply colored and flavored yolks. Geese only lay about 40 eggs a year, mainly in the spring, which, in addition to their size, helps raise the cost. Look for goose eggs at farmers markets and specialty stores in early spring. If you are having trouble finding any, ask around to see if any farmers are raising geese. They may be keeping the eggs for themselves, but might be willing to sell a few to the culinarily curious. You can use goose eggs in any recipe that calls for eggs, so long as you take the increased volume into account and adjusted for it A good rule of thumb is to use one medium goose egg for every two large chicken eggs. The Spruce Eats / Bailey Mariner. Goose eggs vary in size, so you'll need to use some judgment as to their volume based on the specimens you have in hand. 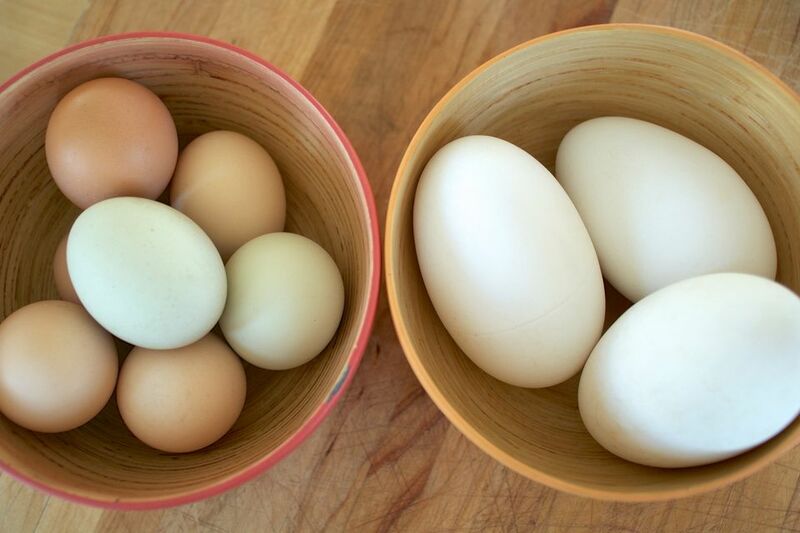 Most recipes call for a large chicken egg, which measures 1/4 cup. This is a good measure to keep in mind when making a substitution. Goose eggs have a noticeably bigger yolk and correspondingly less egg white than chicken eggs, which can lead to heavier, moister, denser baked goods. If you decide to give them a whirl in a baking recipe, try adding a chicken egg white or two to the mix to balance things out. You can use goose eggs in simple egg dishes like omelets or a Spanish-style tortilla where their richer flavor really shines. Or simply savor them by soft-boiling or poaching; a fried goose egg is enough for a couple of people to share. Some chefs particularly prize goose eggs for making pasta; the pasta is rich in flavor from those extra-huge yolks, and the elastic texture is enhanced from the protein-rich whites. Try using goose eggs in some homemade egg noodles to see for yourself. Don't be surprised when you bang that goose egg on the counter and nothing happens; goose egg shells are much harder than chicken eggshells. Because of this, they can be a bit of a challenge to break, requiring greater force to crack them open and a corresponding greater chance of breaking the yolk in the process. Increase the force you use incrementally to avoid a shattered shell and drippy mess.